Investing in your skin is the best thing you can do to show it some TLC. After all, you want to feel good, look good and radiate all day everyday, right? However, with sensitive skin it’s always a little tricky to decide what products to pick and what skincare routine to follow. Any chemical can cause sensitive skin to breakout! If your skin is sensitive, you will often feel roughness, reactions and irritations on applying certain skin care products. If this persists, then it’s time you switch up your skin care to products that are specially formulated for your skin type. Everyone’s skin has a certain type and if some products with harsh ingredients are reacting negatively on your skin, then you definitely fall under the sensitive skin category. Our faces are exposed to air or water pollutants, heavy makeup and even the harsh rays of the sun, on a daily basis. All these unavoidable elements are what takes a toll on the skin, making it sensitive. However, your body needs to be prevented from the dryness and sensitivity too. If you are prone to sensitive skin, then you need products that’ll soothe and restore your skin. 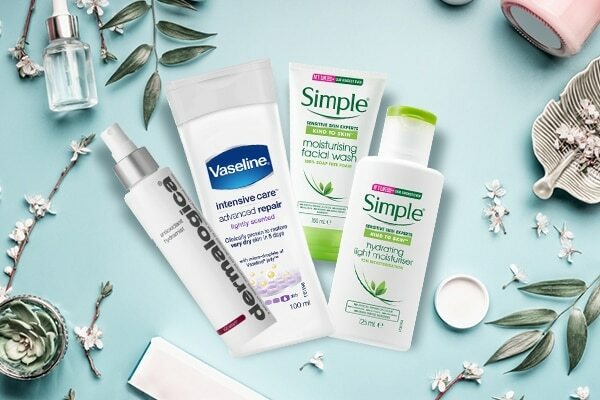 Dealing with sensitive skin just got easy, with products that your skin will love. Our face is the first thing that is exposed to all the dirt, grime and dust. Therefore, it’s ideal to use a face wash formulated for sensitive skin type, such as the Simple Kind To Skin Moisturising Facial Wash. A facial toner too, can work wonders in keeping your sensitive skin hydrated and nourished. Try the Dermalogica Antioxidant Hydramist which helps in tightening and firming skin and protecting it from damage. To keep your entire body moisturised and hydrated throughout the day, it’s ideal to pick a moisturiser that your sensitive skin will thank you for. We love the Simple Kind To Skin Hydrating Light Moisturiser and Vaseline Intensive Care Advanced Repair Body Lotion. Why we love night creams and you should too!